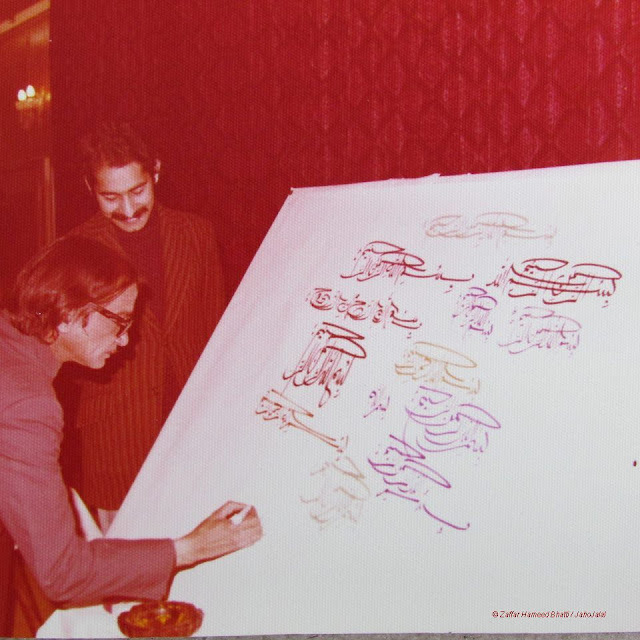 In one of my earlier posts on legendary artist, calligrapher and muralist Sadequain, I mentioned how one of my elder brothers Zaffar Hameed Bhatti got to know Sadequain and how a professional relationship between the two developed that lasted till the death of Sadequain. Just to recap the first meeting between my brother Zaffar and Sadequain, this is how it happened. 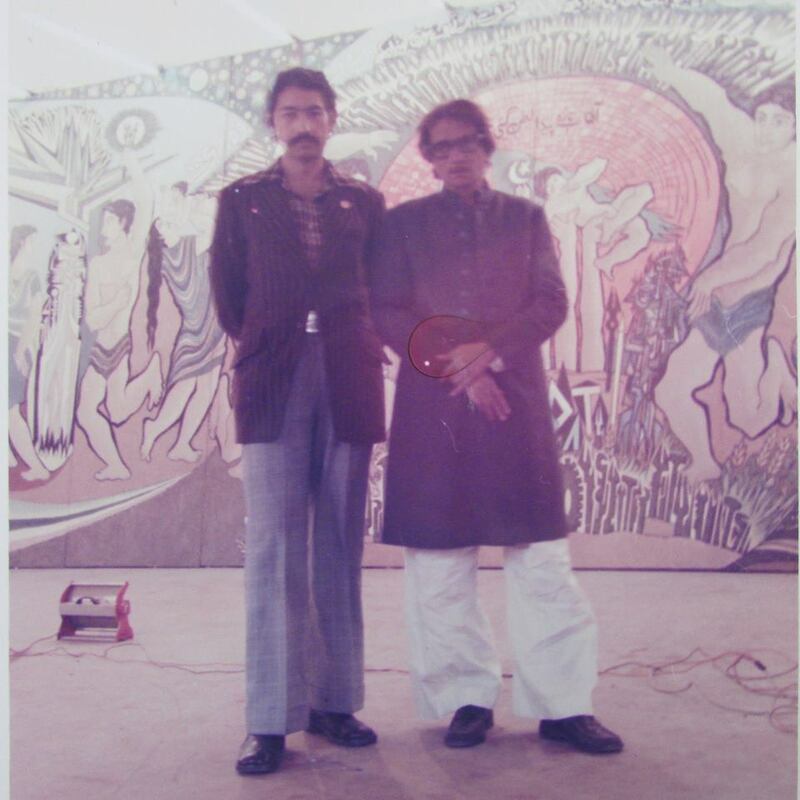 In early 70s, Sadequain was working in the Lahore Museum and Jinnag Garden on a number of life size murals for the Lahore Museum. As it happened one day that my brother who was then studying in the Government College was standing on the bus stop opposite Lahore Museum, when he spotting Sadequain strolling on the footpath and taking a dose of the fresh air after working for long hours inside the museum. Seeing a golden opportunity, my brother rushed to the nearby paper market, bought an autograph book and a pen and rushed to Sadequain for an autograph. 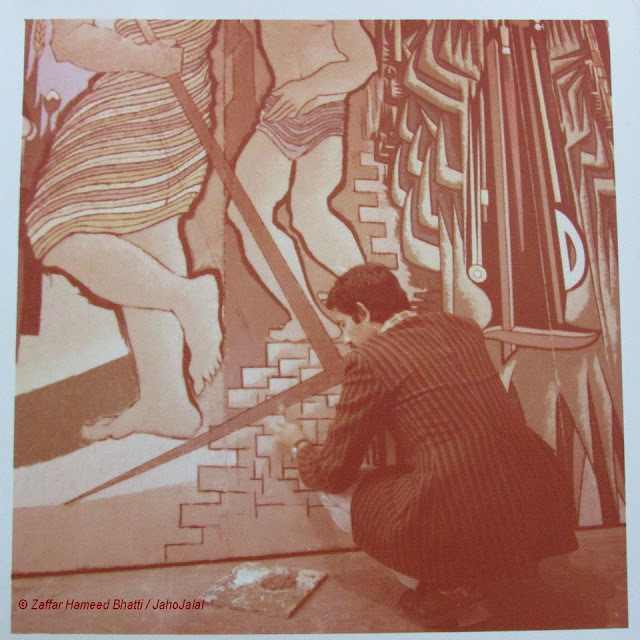 And from the a long association started between the two and my brother would spend endless hours with Sadequain and helping him finish his many paintings and calligraphies. 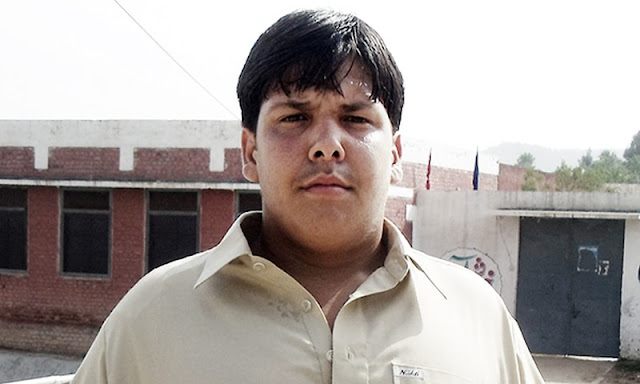 Later my brother got a job in the Pakistan Ordnance Factories and moved to Wah. But the communication between him and Sadequain never broke. 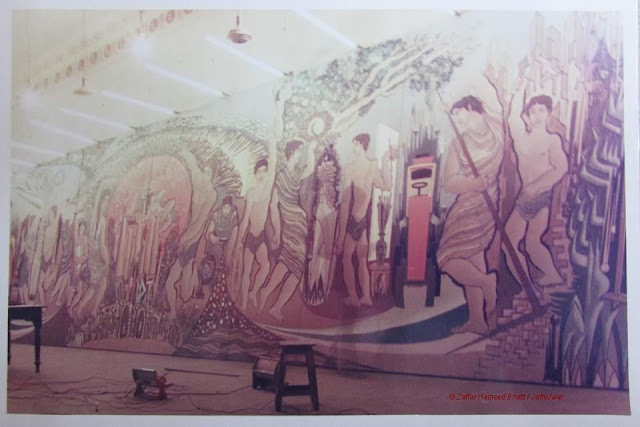 In those days, Sadequain was busy in his new project for murals for Pakistan Sports Complex, Islamabad and needed my brother to finish his huge work. For this, he requested the chairman POF to spare my brother for a month to help him in his project. The chairman duly obliged Sadequain and sent my brother to Lahore. In those days Sadequain had his abode in the Jinnah Gardens' Montgomery Hall. Here the two worked day and night to complete the project. Here it may be mentioned that the help provided to Sadequain was purely voluntary and no monetary gains expected. The mere working with a legendary artist was more than any worldly gains. One day while brother was standing on a raised pedestal working on a huge mural, his head hit the fans overhead. Sadequain who had just happened to saw the incident, immediately called my brother down and asked the administration to remove the blades of all fans lest a fatal incident may occur. Thereafter, my brother worked on the murals without any threat from overhead fans (as can be seen in the photo above).